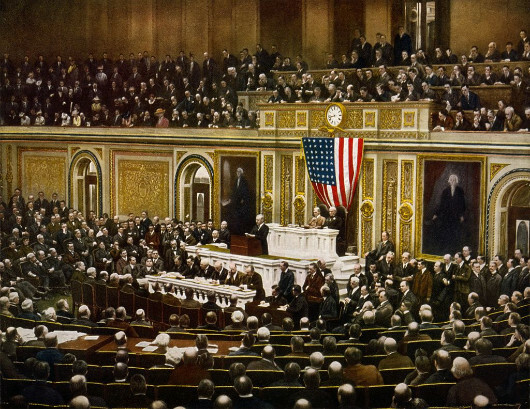 Last week the United States observed the centennial of its entrance into World War I, or what was once known as "The Great War," until an even larger conflagration enveloped the globe a few decades after the close of the the "War to end all wars." In this week's edition of Sightings, Martin Marty remembers that day by digging up comments made by Anglican clerics in support of the war, even embracing revenge and retaliation as suitable responses to the enemy. When war breaks out, it does seem as if the temptation to go all in is hard to resist. I can't find the reference, by Edgar Dewitt Jones, founding pastor of my congregation, confessed that he had been caught up in war fever during the First World War. He regretted his fervor. He made that confession during the interregnum between wars. I can't find any references to World War II, so I wonder if he got caught up once again? In the meantime, Marty invites us to consider the responses, noting that not all got caught up in the hatred. Thursday the United States observed the centennial of its entry into World War I, a move which, historians like to say, “changed everything.” The nation lost 116,000 troops while nine million lives were lost worldwide. The map of Europe was reconfigured in the following years. Dictatorships arose, and the stage was set for Act II of what seems now to have been a two-act World War drama. Americans like to observe centennials, so this should have called for a major observance. Did you notice any? If you lived in Kansas City, Missouri, you could look out the window and see “several thousand people” gathering at the Liberty Memorial. USA TODAY helped Sightings find the occasion, its coverage by Rich Hampson ending with a quote from historian Richard Rubin: “There was a time when the war was terribly important. What did people once know that we’ve forgotten?” Hampson and a few others discussed whether what they knew might inform the United States in its time of new high-risk ventures in relation to Russia, China, ISIS, and Syria. Not competing for attention on those stages, I used the season to revisit old accounts of that war and what it shows about how religious and other leaders can get swept up and caught up in hyper-nationalism, patriotic idolatry, and loss of self-critical (or prophetic) perspective. Specifically, I reopened a book which has always informed me and haunted me: Albert Marrin’s The Last Crusade: The Church of England in the First World War. We have space only to sample some invective uttered or written by Anglican and other church leaders, matching that of German Lutheran and Catholic clergy, also briefly noted by Marrin. - Doyle, Arthur Conan. “The Uses of Hatred.” First published in The Times on December 26, 1917. Reprinted at The Arthur Conan Doyle Encyclopedia. Modified July 15, 2016. - Hampson, Rich. “Trump and the war that helped make America great in the first place.” USA TODAY. April 4, 2017. Updated April 5, 2017. - Leonard, Mary Delach. “100 years later, St. Louis and the nation remember ‘The Great War.’” St. Louis Public Radio. April 5, 2017. - Marrin, Albert. The Last Crusade: The Church of England in the First World War. Duke University Press, 1974. - Rosenberg, Jennifer. “Everything You Need to Know About World War I.” ThoughtCo. Updated March 17, 2017. Copyright © 2017 The University of Chicago Divinity School. All rights reserved.